If I’m going to do a write up on a restaurant, I’ll often head there with those very intentions, camera in hand, so that I can return and give you all a nice, detailed, photo-filled report. I’m going to bypass all of that this time–not because this restaurant does not deserve the full shebang, but because I was treated with such consideration on our last visit that I’m still feeling grateful two weeks later and don’t want to wait any longer to tell you about it. One of the things Chris and I love most about our neighborhood is the abundance of small, independently owned restaurants and shops (I still avoid making eye contact with the Dunkin Donuts/Baskin Robbins combo that unfortunately popped up here a couple months ago). Testaccio is one of these fantastic little spots. 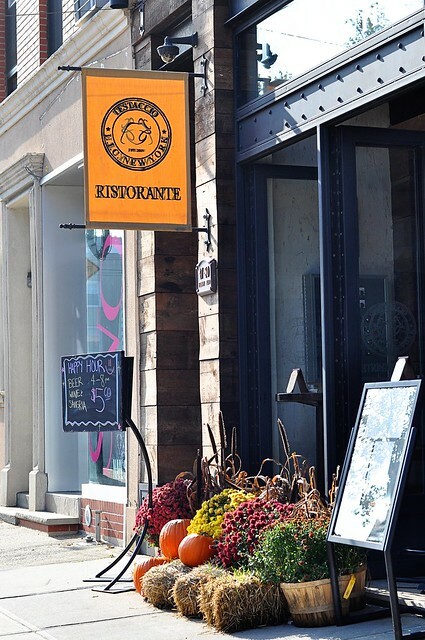 It’s a classy-casual restaurant that offers traditional Italian dishes and great wine. It is always one of our first suggestions when friends and family visit and we have never left disappointed. In addition to being close to home, what makes Testaccio particularly wonderful for us is that they offer gluten-free pasta. They don’t advertise it on their menu or their website, but they do keep it on hand. And they’re thoughtful about making and serving things to their gluten-free customers. When we went for dinner a couple weeks ago I ordered a pasta dish that I’d never had before. The majority of their pasta dishes are fine once you sub in the GF pasta, but just as the chef was about to add the sauce to my gluten-free pasta that night, he remembered that that particular sauce was made using a demi glace that contained flour. The waitress was extremely apologetic and asked what I would like instead. I wondered if another item that I recalled seeing on the menu would be okay and, after consulting with the chef, she said that–just to streamline things and be totally safe–he was going to go ahead and whip up a sauce especially for me. Due to all the confusion it took a little longer than usual for our meal to come out, but when it did it tasted better than ever. It could have been the fresh-from-scratch sauce, but I have a feeling it had more to do with the fact that, even though I made their night a bit more complicated, the chef and the waitress were nothing but kind and accommodating to us. This is why we love Testaccio. Yes, the food is quite good, the atmosphere is great, and we don’t have to hop on the subway in order to get home, but we wouldn’t continue to go back if we weren’t also treated well. The service, while not so doting under typical circumstances, is always pleasant and respectful. I may have written about Testaccio eventually…though maybe not. It’s our own little neighborhood gem and we feel sort of special that, despite the lack of signage, we know about their stash of gluten-free pasta. After that experience, however, I felt like they deserved whatever kind of endorsement I could provide and that you deserved to add another quality restaurant that can feed you well to your list–and I mean that whether you’re gluten-free or not. Note: Since it’s not something that they advertise/specialize in, if you have your heart set on ordering GF pasta, call ahead just to make sure they have it around. What a lovely review! They sound like nice, considerate people. I can see why you love it. If I’m ever in NY, I’ll be heading there. I have Celiac Disease and my boyfriend and I are coming to NY for our first time Dec 28- Jan 4. I’ve been researching some restaurants that we can go to, and your list has definitely been of help! I can’t wait to try out Pala (one of your earlier posts).